This week, I had a special guest as my friend Michel Boucher visited for a couple of days. Michel took the train down from Ottawa Monday morning. I met him at Union Station and we took the subway and streetcar back to my place. (As a train enthusiast, taking three modes of rail-based transport in one day is sure to put a smile on one’s face.) At home, we were met by Chris Abbott – and my wife joined the three of us as we headed to Bar Italia for lunch. This is a great spot for steak sandwiches and a robust red. Monday evening, Michel, Chris, Pierre and I headed to Harbord House, where I’d booked the upstairs for a gathering of fellow modellers. (I’ve written about these previously, and I timed Michel’s visit so he could attend one.) We had 27 people for dinner and it was another great evening of conversation and food. Michel stayed over Monday night. 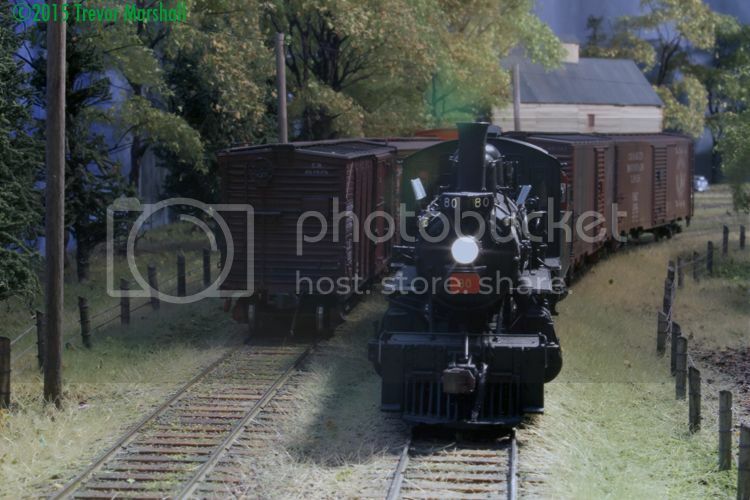 On Tuesday, we headed to The Credit Valley Railroad Company for a bit of retail therapy. Chris lives in the area so he joined us, and I was pleased to meet Gord Ross at the shop. Gord has been reading and commenting on this blog for a while now, and it was wonderful to put a face to the name. I’m looking forward to getting together with Gord sometime soon. Chris, Michel and I grabbed lunch near the store, then Michel and I headed home – and then back onto The Better Way to Union Station and Michel’s train home. What an awesome couple of days. My laugh muscles are sore from having too much fun. I met Michel in the 1990s when I lived in the Ottawa area, and we became fast friends. 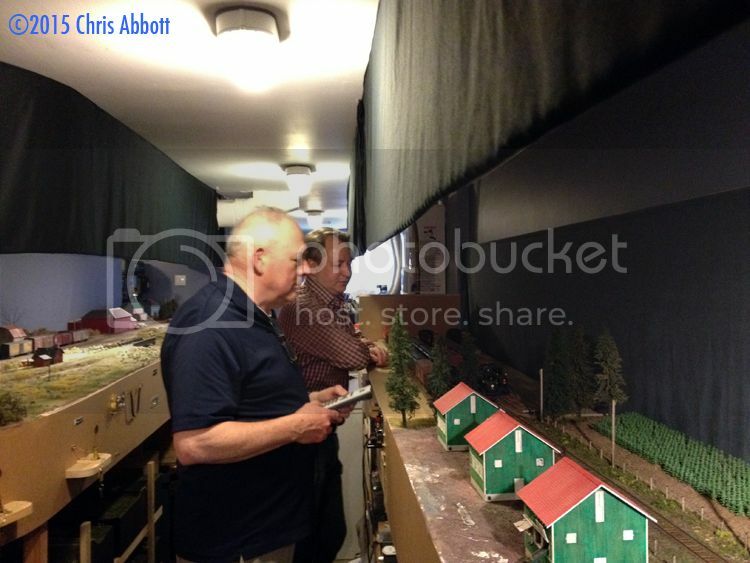 I attended regular operating sessions on his home layout. 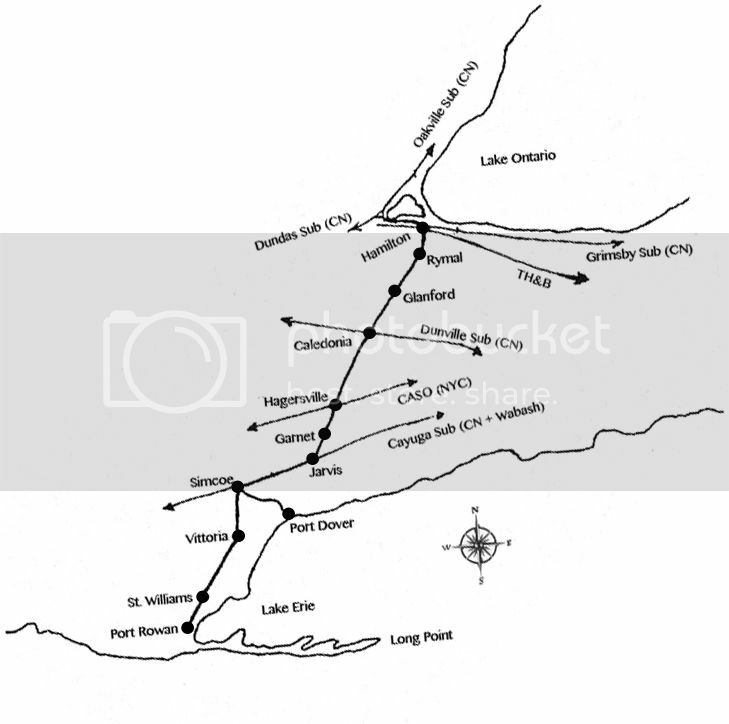 Initially, this was the Ontario Central Railway – a freelanced line connecting Picton and Marmora. Later on, an interest in the Delaware and Hudson Railroad prompted Michel to reconfigure the layout as the D&H Adirondack Branch from Saratoga Springs, through Corinth, Warrensburg, North Creek and Sanford Lake to the mins at Tahawus. I learned a lot about layout operations at Michel’s sessions – including one of the most important lessons, which is that a layout has to run well when company comes. Michel takes great care to make sure this happens – and the result is an enjoyable operating session for everybody (including the host). 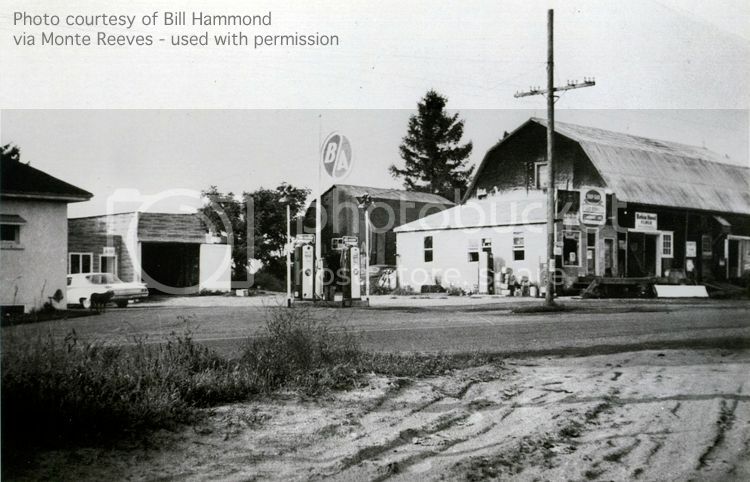 Thanks for that lesson, Michel: It has definitely influenced my Port Rowan layout. It was great to see Michel – and it’s been too long. I’m looking forward to visiting his place later this year. Grab a coffee or cold beverage and join Chris Abbott and myself as we wire up my S Scale Workshop modules on this week’s episode of “The RoadShow” on TrainMasters TV. Chris knows more about wiring than anybody I’ve ever met. He’s explored many options, and he’s come up with some great answers to make the wiring of modules (or stand-alone exhibition layouts) stand up to the rigours of transport and storage, as well as some tricks to minimize the chances of error when the pressure is on and you’re trying to set up and test a layout before the train show opens. Not just a “here’s what we did” video – but also a lot of information on why we did things and some of the things to definitely avoid. The segment runs just over an hour and there’s a lot of information conveyed. Thanks, Chris, for coming out and helping with this: the wiring worked out beautifully as a result, and it was a grand day out at the TrainMasters TV studios! 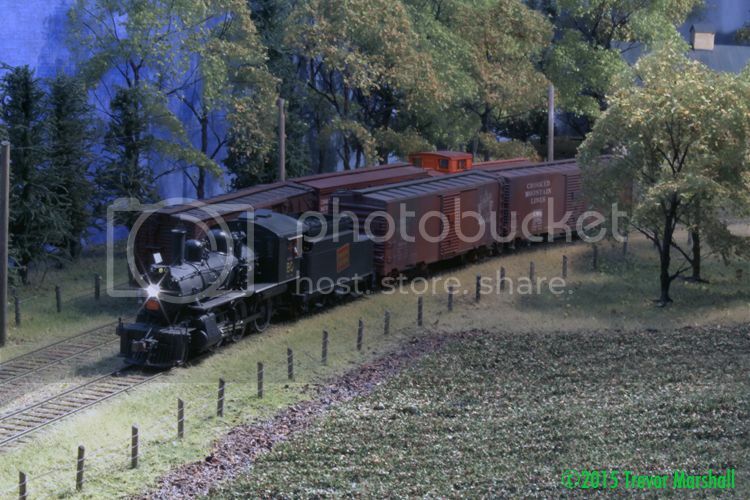 Some places on the layout naturally lend themselves to nice photographs. 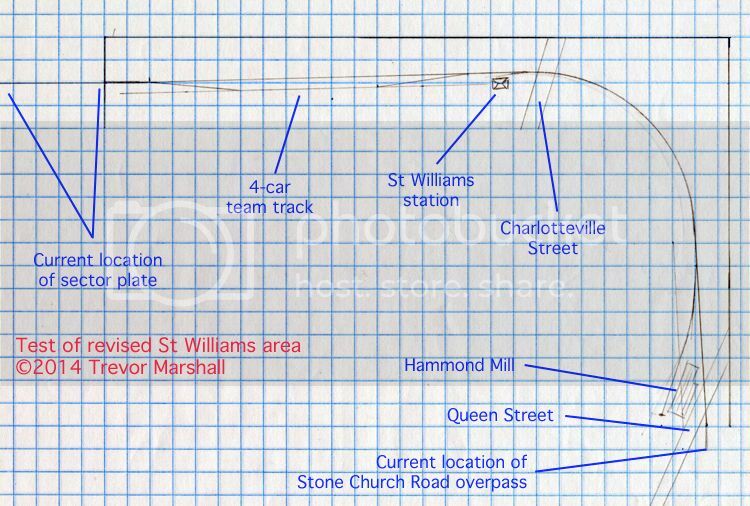 The east end of the St. Williams storage track is one of my favourites, because I can pose two locomotives beside each other here and get a camera right into the scene. It turned out well, I think! Due to a scheduling SNAFU, Nelson Allison from Aberdeen Car Shops found himself at loose ends in my neighbourhood last night. He emailed and as it happened, I too had an evening to myself. 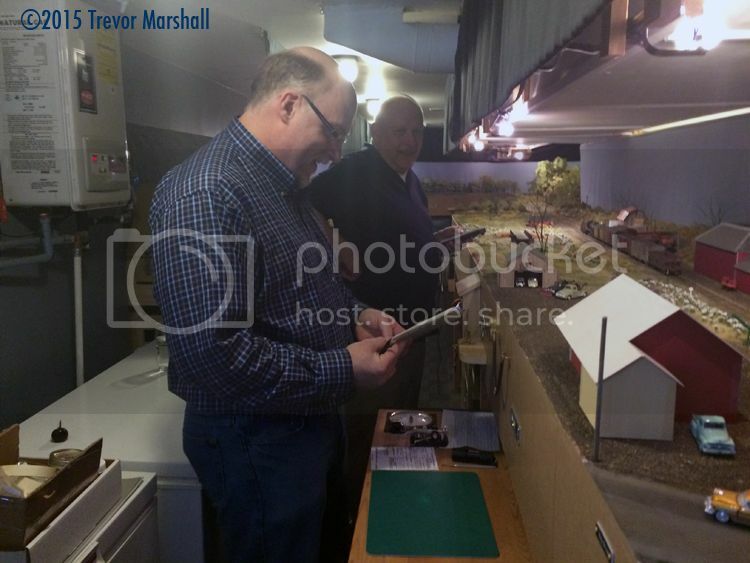 So I met Nelson for a beer, then we headed to my layout room for an operating session. 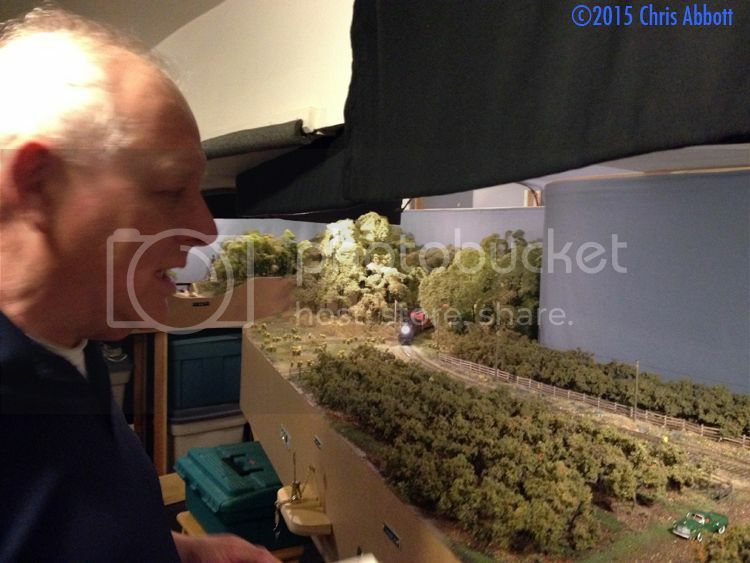 It was Nelson’s first visit to the layout, so there was a lot to cover. 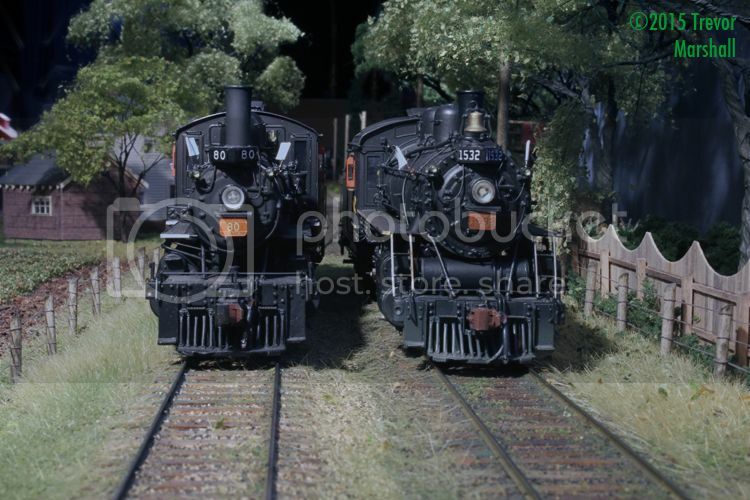 We discussed layout lighting, ambient audio, decal manufacturing (through Aberdeen Car Shops, Nelson offers some terrific decals for modellers of the Toronto Hamilton and Buffalo Railway, as well as other goodies), Sergent couplers, WOW Sound decoders, and more. I was also pleased that the layout operated really well – the best it has all year. Nelson took the throttle on a freight extra while I hopped in the van, and we safely and smoothly switched seven cars over the course of a few hours. (We took our time.) No derailments (phew!) and only one false coupling. My kind of operating session! Thanks for getting in touch, Nelson – I’m glad that serendipity was on our side. I had a great time! Reader Ian Maynard asked for a video of the River Raisin Models Model 40 Burro crane in action, now that I’ve added a TCS M1-KA decoder plus KA2 Keep Alive module. Enjoy if you watch – but be advised: the video runs 2:49, but it’s not what I’d call “action packed”. But then again, neither is conducting maintenance along an almost-gone branch line. I’ve written a lot about my RS18 project to describe the modifications, the painting, and the installation of DCC, sound and lighting. This short video pulls it all together, to provide an idea of how this beast performs and sounds on the layout. And frankly, I was underwhelmed by its performance. The problem is the Burro’s short, stiff wheelbase, which makes it unreliable when picking up power. I thought I had adequately addressed the issue when I worked on the crane back in September, 2012. Originally, I installed a Lenz Gold decoder with Power-1 module. But it has proven less than satisfactory, because it just doesn’t hold enough power in reserve to deal with things like grass-covered track or the long (but powered) frogs in my turnouts. Since doing the initial Burro project, DCC manufacturers have introduced better power storage devices. My favourite these days is the KA-2 – a storage module from Train Control Systems that will hold up to 15 seconds of reserve power. I disassembled the Burro and replaced the Lenz decoder and power storage module with a TCS decoder and KA-2. The KA-2 is held in place with a strip of double-sided tape. The new decoder (not shown) is the M1-KA. It’s tiny, and I ended up taping it to the inside of the back wall of the cab with some more double-sided tape. The retrofit took less than an hour – from collecting the tools and materials… to disassembly, replacement and reassembly… to reprogramming. And the performance is a lot better. There’s no more stalling – even through the four-turnout yard throat in Port Rowan. 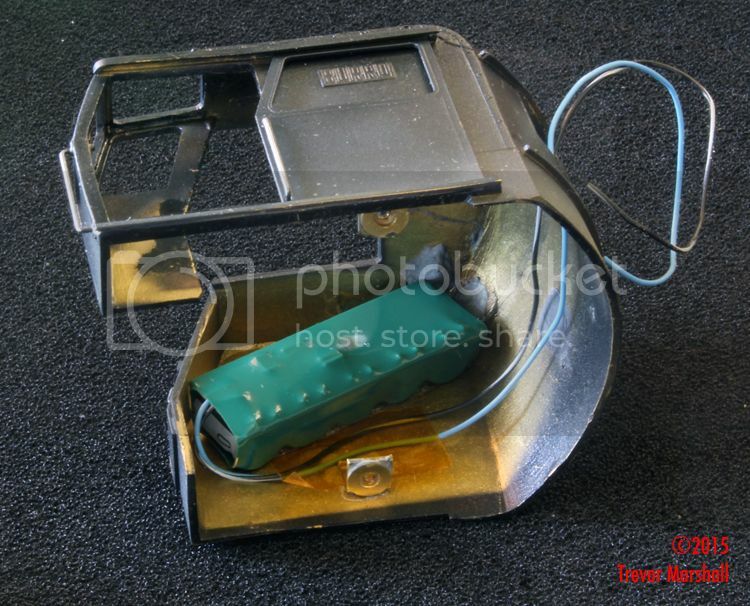 As a bonus, the decoder is better concealed within the cab, so it’s not visible through that rear window. I’m really glad I did the upgrade. I’ve never been to this meet but it’s been on my hobby “to do” list for a while. 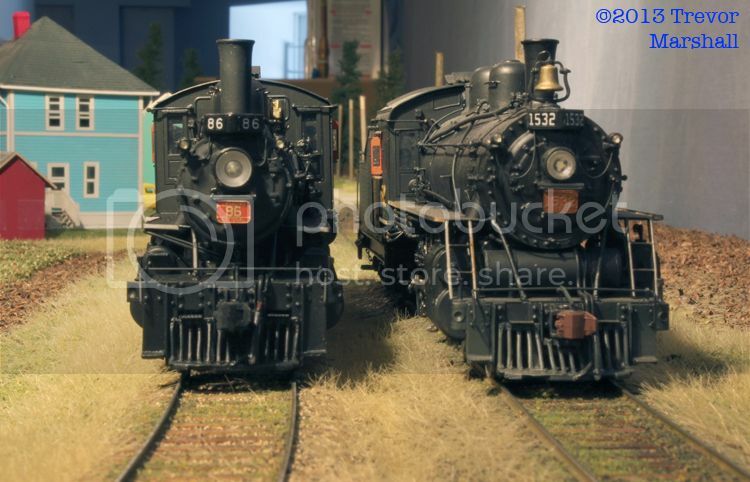 Photos from previous meets (accessible through the RPM’s website) show a healthy dose of expert modelling on display, including many examples of New England and Canadian prototypes. Almost all of my layout-building efforts have been either New England or Canadian in origin, so I know I’m going to have a great time. Naturally, I’ll contribute to the display table: I wonder if it’ll be the first example of “S scale Canadian” at the event? I’ve also offered to do a clinic, although I’m a bit late to that party and the schedule is full. At the organizer’s request I’ll prep one anyway in case there’s a last-minute cancellation. If you’re in the area – or can be – why not register and find out? I’ll see you there! 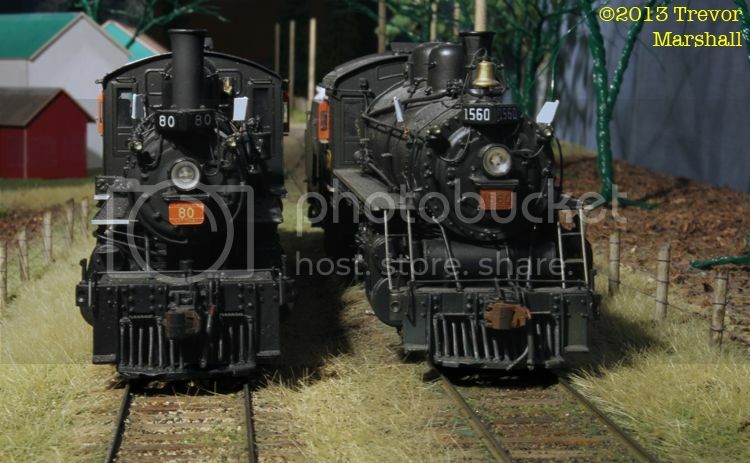 In his emails to me about the 3-dome tank car project, Jim King at Smoky Mountain Model Works mentioned that he’s still looking for reservations for the GS gon – particularly for the Canadian National Railways variant, which I’ve written about previously on this blog. The (drop) bottom line is, numbers for a CNR-specific version need to be a lot higher than they are. That’s unfortunate because these cars were real workhorses on the CNR. On my modest layout, I can think of several uses for them. 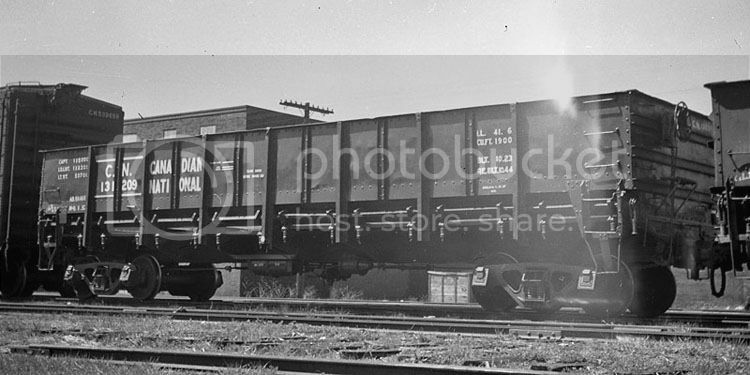 For example, GS gons were popular for hauling ballast for the railway. Gravel pits at Hagersville were just up the line from Port Rowan, so I could have a car or two in-train – picked up at Hagersville on the way down but headed for Hamilton and points beyond. The GS gons would also have been used for hauling aggregates for construction projects – including highways and other public infrastructure undertakings. I can easily justify a few loads of gravel spotted at the team track in either St. Williams or Port Rowan. 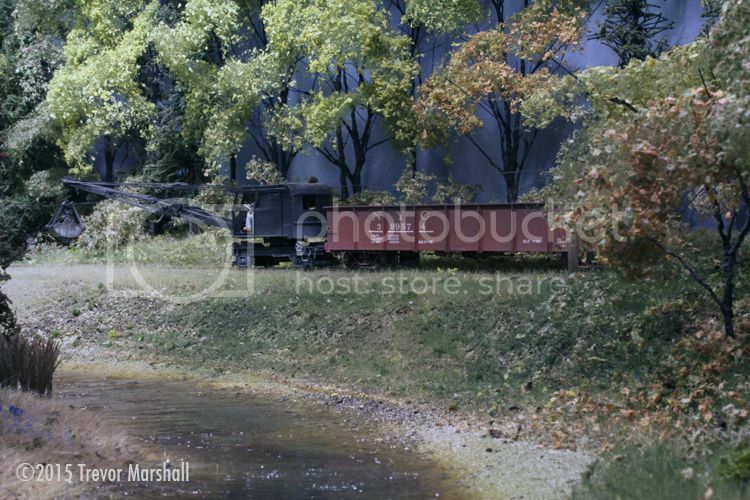 Given all of their uses – and the fact that different loads would weather the insides of the cars differently – I can easily justify eight to 10 models of these essential freight cars. 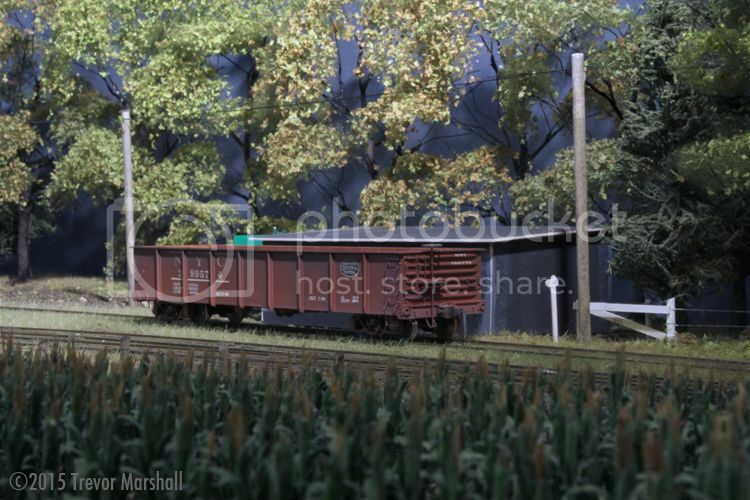 If you can come up with uses for GS gons on your Canadian-based S scale layout, make sure you place a reservation with Jim.